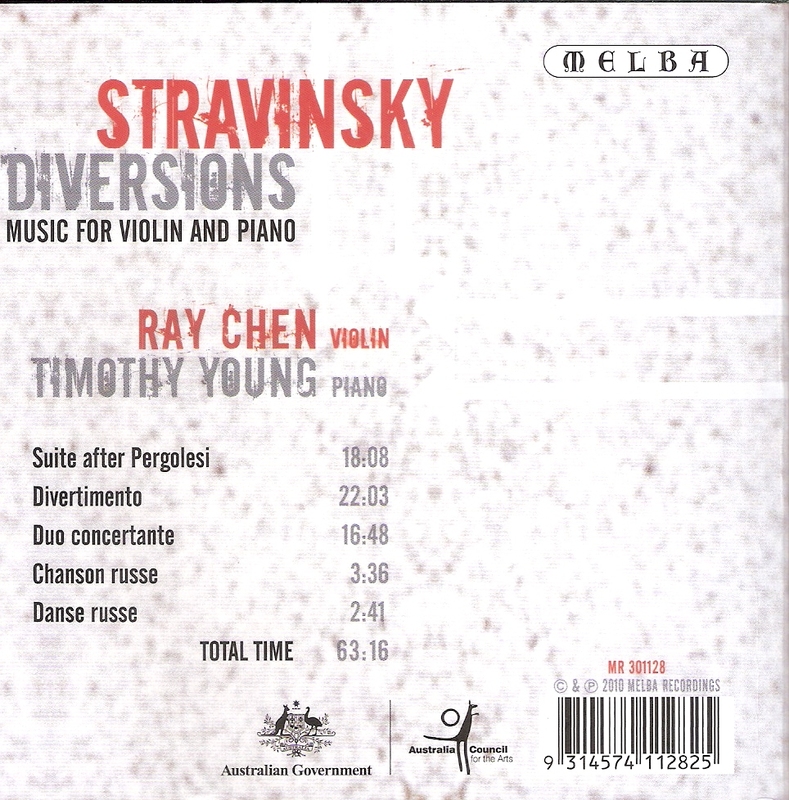 Two months before Ray Chen signed his exclusive recording contract with Sony Classical, Melba was able to slip in and make these recordings in the Iwaki Auditorium, Melbourne. It seems only right that an Australian label has been able to claim some of Chen as its own property for, having been born in Taiwan, he spent his childhood in Brisbane before heading off to the States and the Curtis Institute, and from there to "rising star" status via success at the 2008 Yehudi Menuhin and 2009 Queen Elisabeth competitions. 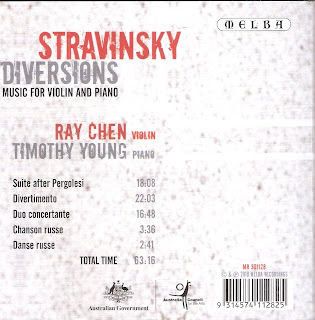 For his Melba disc Chen has teamed up with Australian pianist, Timothy Young, and a highly impressive pairing it proves to be. Stravinsky's music for violin and piano is perhaps a surprising choice for a young violinist set out to impress the world with his virtuosity, and the choice of repertory as well as the fact that everything here is quite a bit slower than on most comparative versions - the most obvious being Anthony Marwood and Thomas Adès on Hyperion CDA67723 – seems to point to a desire to show musical integrity above blatant showmanship. His first release for Sony is of more virtuoso fare (indeed the disc is entitled "Virtuoso") so, perhaps, he saw this recording as a last chance to show the world his musicality uncluttered by bravura displays before being turned into another high-flying Asian wunderkind by the Big Boys of the music industry. Whatever the thinking behind it, and whatever superlatives come to be attached to Chen's violin playing in the years ahead, I'm delighted that he has recorded this disc for, notwithstanding a sometimes painfully slow account of the Suite on Pergolesi themes (which will be familiar to most as Pulcinella), these performances are outstanding for the intuitive feel Chen clearly has for this music. His leisurely, spacious approach works particularly well in the Divertimento from The Fairy's Kiss, where the relaxed atmosphere provides ample opportunity to revel in Chen's sumptuous tone, his delectable purity in the upper register and his gloriously robust lower register. His crisp and nimble articulation is, if anything, greatly enhanced by the slower tempi, and I am particularly taken by the wonderful poise he brings to all those ostinato and repeated figures which are such a persistent feature of these pieces. There's tremendous dynamic energy here, too, with everything superbly measured so that the long build-ups to climaxes take on an almost hypnotic character. 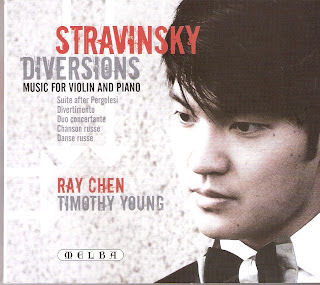 If I were to point to a single track on this disc where Chen's qualities as violinist, serious musician and interpreter of Stravinsky all came together to their best effect, I would go to the captivating "Danses Suisses" from the Divertimento. Timothy Young proves a particularly sensitive partner, never getting in the way, deftly handling the often complex textures – so much of the piano writing here is simply a reduction of the orchestral score – and with a lightness of touch and graceful fluency which adds a marvellous piquancy to the bubbling "Gigue" from the Duo Concertante. And he's certainly having an absolute ball in the splendid Chanson russe where Chen is happy to take a back seat and merely add his decorative gloss to what is some truly magnificent piano playing. The adoring crowds, chasing their fix of dazzling violin pyrotechnics will, I'm sure be looking to Chen in the years ahead – and I suspect they will not be disappointed. But one hopes they may be tempted to delve into his inner musical heart by checking out this magnificent disc; I defy anyone not to be profoundly moved by the impressively restrained passion and statuesque poise both these outstanding players bring to the Duo Concertante's closing "Dithyrambe".